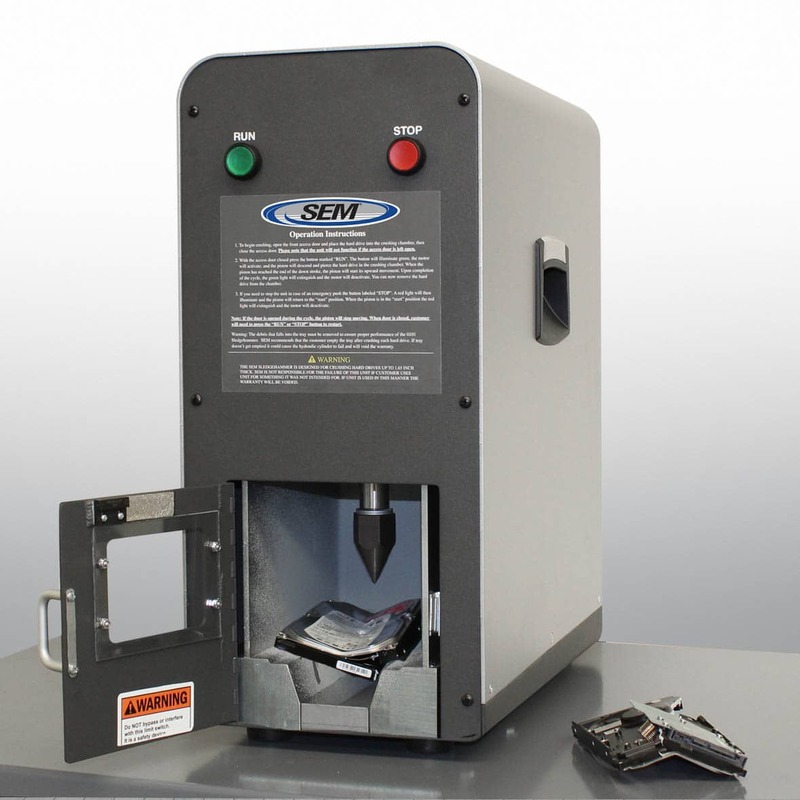 While recently attending an Information Security Conference at an OCONUS Military base, an SEM HARD DRIVE SHREDDER was on display (similar to the one pictured here). Everyone was in awe of the utter speed in which it just devoured complete hard drives, turning hard drives into shredded particles. Even though everyone appreciated the shredder’s security level, throughput , performance and its extreme destruction capabilities. here is how SEM was able to provide a workable solution. DRMO generally won’t – and shouldn’t – take drives for recycling until they are physically destroyed. So, more often than not, drives are collected and securely stored away until a security inspection or you run out of storage. Let’s face it, while nail guns, bullets, and running them over with tanks are all exciting methods of destruction, they frankly aren’t the safest nor do they meet the security guidelines as an approved destruction method. Most Unit and Tenant Commands that handle Classified Data are already utilizing a Degausser. They just generally don’t have an approved physical destruction method other than one of the aforementioned. And even though the volume is usually small, these aforementioned methods are not safe practices. Safety is paramount these days as we all know. The majority of drives on a Base generally come from Records Management, Contracting Commands, PERSCOM, DOD schools, etc., during normal refresh programs, all these being CUI (PII/FOUO) applications generating enough volume to justify the SEM “Jack-Hammer” as the proper solution. The WING, in this case, decided to centrally locate an SEM HDD SHREDDER to be utilized by both Classified and CUI users. Since the TS drives have already been degaussed and the data has been sanitized, they can be safely and securely transported to the centrally located Hard Drive Shredder for final destruction without leaving the Base. The solution was smart, efficient and cost effective for all.